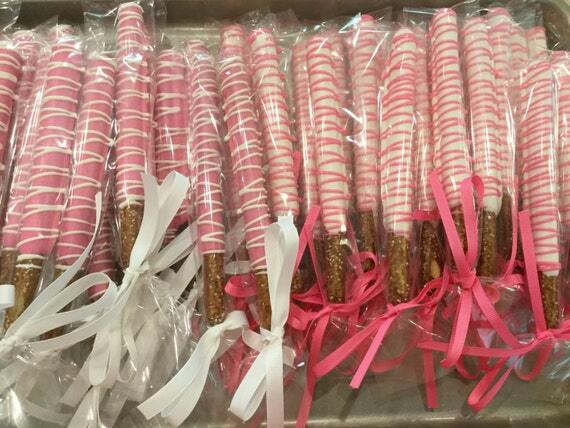 This listing is for one dozen (12) chocolate covered pretzel rods. Message me to change color scheme or design. SHIPPING/PACKAGING: Each layer of pretzel is securely packaged in bubble wrap, surrounded by more bubble wrap. I take extreme care in packaging your pretzels up for the safest delivery possible. Although the pretzels are packaged with care, we cannot be responsible for any breakage that may occur during shipping. I do not have any control over the pretzels once they leave my hands. I do include an extra pretzel in every order in case of breakage. In summer months we ship every order with ice packs and insulated packaging. There is no additional charge for ice packs.